Seeing conditions: moonless, transparency 2/3, Antoniadi III, Bortle 8. At the end of 2013 I had the opportunity to look once again to a clear southern sky so I decided to go for it in the first days of January. On the early morning of January 4th I went to the whole nebula, this time, through my telescope view. 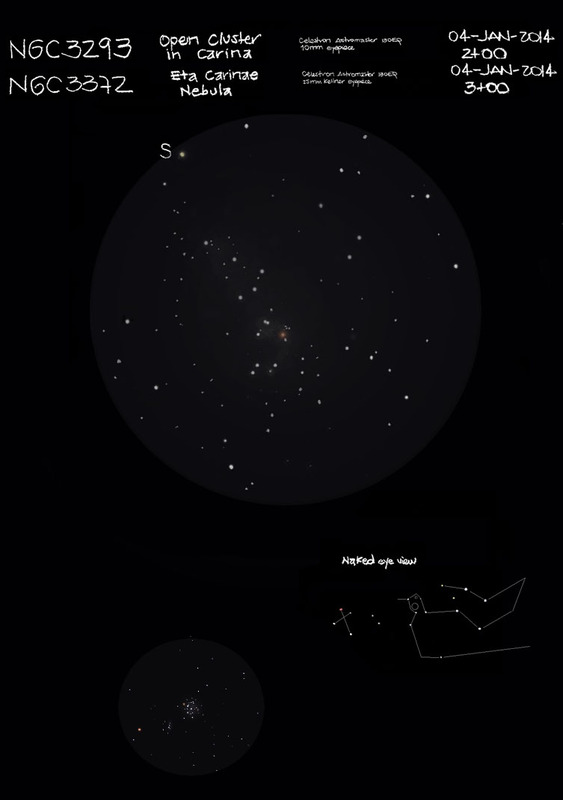 It was just an amazing view that I could only sketch approximately 80% of the stars I could resolved. I am just concern about the star Eta Carinae: all the information I got about it says that it is a blue variable giant. I´m not sure why is classified like that, if in true it looks like a red giant. Hope you know the answer. I have the whole entry (original sketches too) of this observation in my blog. Thanks to all for watching!! !